SS-20L-24 Charge Controller 24VDC, 20A, LVD. SL10L-12V SUN LIGHT Charge Controller, 10AMPS, 12Volts. SL-20-12 SUN LIGHT Charge Controller, 20AMPS, 12Volts. SL-20-24 SUNLIGHT Charge Controller, 20AMPS, 24Volts. PS-30M Charge Controller, 12VDC, 30 AMPS, W/DIGITAL METTER. SS-6-12 SUN SAVER Charge Controller 12VDC, 6.5A. SS-6L-12 SUNSAVER Charge Controller 12VDC, 6.5A, LVD. SS-10-12 SUNSAVER Charge Controller 12VDC, 10A. 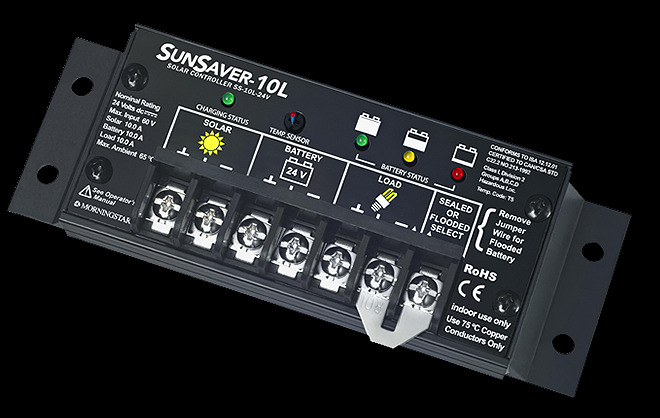 SS-10L-12 SUN SAVER Charge Controller 12VDC, 10A, LVD.